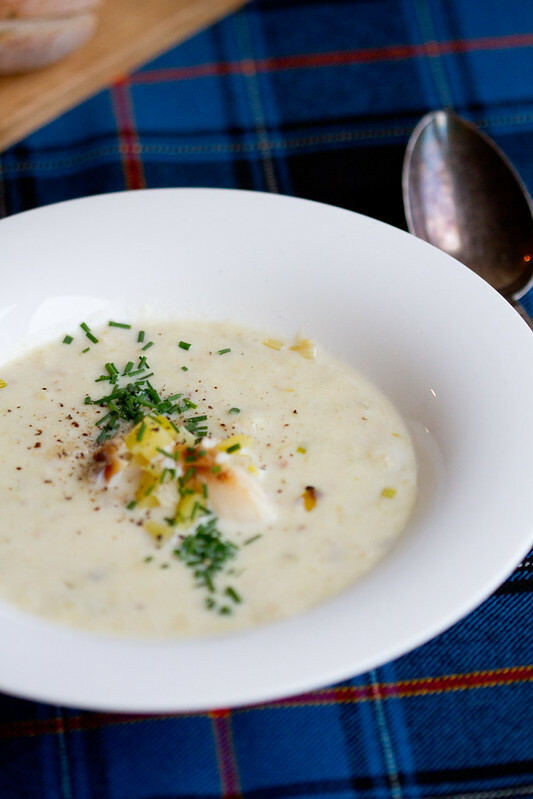 The soup is from the North-East of Scotland, from the fishing town of Cullen. Originally it's a comfort food, cheap and easy fare, and it's still popular in and around Cullen. Yet somehow that humble soup has tranformed into a fancy fare to be enjoyed at various festive Scottish occasions. Scots know their smoked fish. Arbroath Smokie is a pair of salted haddocks, hot-smoked in a humid smoking chamber. Finnan Haddie, the traditional fish used for making Cullen Skink, is gutted and cleaned haddock that's been dry-salted and then smoked in a cool smoking chamber for 8-9 hours. If Finnan Haddie is hard to find where you live - that's probably most of the world apart from the British Isles - (and avoid the bright yellow dyed stuff, it discolours the soup), then any other nice smoked white fish would do. I used smoked cod, a user of my Estonian Nami-Nami site said that the soup worked well with smoked herring. Place the fish into a pan, add the bay leaf and cold water. Gently bring into a boil, then simmer for about a minute or two. Remove the fish from the pan, transfer onto a plate and leave to cool. Keep the fish stock! In another pot melt the butter gently. Add onion and leek, cover and sauté gently for a about 10 minutes. Stir every now and then, do not brown! Season with salt and pepper. Add potato pieces to the onion and leek, give it a stir. Add 500 ml/2 cups of fish stock, bring into a boil and simmer until the potato is cooked. At the same time remove the fish from the bones carefully, flake into smaller pieces (discard the fish skin and bones). Using a slotted spoon, take couple of spoonfuls of the potato-leek mixture from the soup and put aside. Discard the bay leaf. Add the milk, bring gently into a boil. Add about half of the smoked fish. Mash the remaining soup or pureé using the hand-held/immersion blender. Season with salt and pepper. 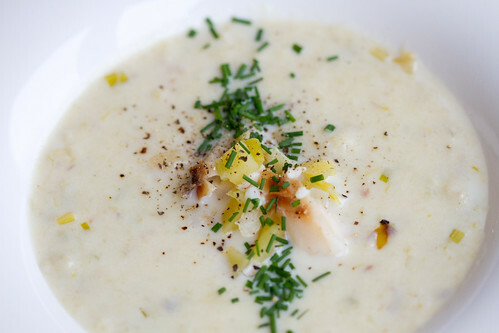 To serve, place a large spoonful or two of potato-leek-smoked fish mixture into the middle of each soup bowl, then ladle the liquid soup neatly into the bowls as well. Garnish with chives and serve. Is that the Estonian tartan?